Meet Cheryl - aka - "The Truth Fairy"
Cheryl's journey into the public spotlight began in 2007 with the release of her first oracle deck, the Path of the Soul, Destiny Cards. It was a tough road for this self-published author. "Most major authors and recognized public figures are backed by the big publishing companies. Not me. It has always been just me and Spirit. I follow my calling, the way I am guided. I never dreamed things would go as far as they have." Cheryl recalls. The Path of the Soul cards quickly made their way to the best-sellers lists throughout North America. By word of mouth alone, her first deck made it's way around the globe. "It was a funny time for me because I was struggling internally with my fears and insecurities of being in the spotlight. I had to really push through those old blocks before I could feel comfortable been seen in such a public way." And luckily for us, she did. A few years later Cheryl released her second deck of cards, the Divine Guidance Oracle Deck which also reigned on the top of the bestselling lists as soon as they hit the selves. She released her first book A Seed of Love in the spring of 2011. There is a lot more to this intuitive artist and author. Cheryl has become an inspiration to many, proving by example that if you trust and follow your Soul's calling, you can do anything. She has become a motivational and heart-felt speaker, touching people's lives where ever she goes. As Cheryl's reputation in the new age communities grows, so too does her conviction that there is a serious need for honesty and humanness in spirituality today. "You won't find any 'fluff & bubbles' here," she states. "The only way to really help people through their lives is by addressing the real issues of being human. It's time to do away with false pretenses that have been created about Spirituality." Securing herself the nickname, The Truth Fairy. Standing tall at only 1.5 meters (4'11 feet), this lively free spirit is empowering audiences around the world. Cheryl was exposed to the world of metaphysics at a very early age. Her father was infatuated with the paranormal and ESP. It was a natural event to sit around the kitchen table with her siblings playing spoon-bending or guessing the suit of a card. The fun of play quickly left when it became more of a show of ability. The pressure of having to "perform" was overwhelming. She would put that part of her life far behind her until many years later. After undergoing many sessions of hypnotherapy for depression, Cheryl's intuitive abilities spontaneously re-opened to her after a particular session where she had a profound and life changing experience. During this particular session she found herself in the presence of Archangels. Her understanding of herself and her gifts would be forever changed. She had discovered that as her intuition re-opened, so too did her new found gifts as a distance healer and animal communicator. At the time, Cheryl was living on a farm with 165 head of horses. So she put her gifts to practice right in her own backyard. Word spread quickly about Cheryl's abilites and she began working with horses living as far away as Australia. Cheryl lives by the motto, "Follow your heart". And that is exactly what she did. Knowing in her heart that distance healing wasn't her exact calling, she remained open to Spirit's guidance, which ultimately lead her to where she is now. She feels blessed to have found a path that combines her passion for art with her gifts as an intuitive channel to bring a powerful message to others. Sorry, Cheryl is not taking appoints at this time. She's busy working away on the sequal to her new book Matchstick. Please check back in a few months. Using a combination of intuitive insight, mediumship and the heart-filled energy of her oracle cards, Cheryl opens a direct line of communication and guidance from the world of Spirit. 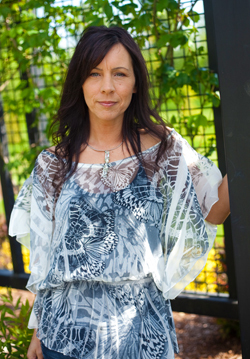 Cheryl's thoughts about readings - "I work for both sides, my client and Spirit. Working for Spirit is both an honor and a privilege. I deeply feel that I have a responsibility to deliver the messages from Spirit and our Loved Ones as accurately as possible. I also have a responsibility to my client, to provide the insight, direction and guidance from Spirit that they seek. I take my readings seriously. These are people's lives, and most who come for a reading are in honest need of communication from Spirit. A lot of the time, people need help to get their lives 'unstuck' or to gain clarity so they can feel confident in the direction they are heading. This is the intention I hold for every reading I do." NO LONG DISTANCE CHARGE! Cheryl will call you at the phone number you provide (no cellular numbers please) on your appointment date. Your card reading with Cheryl will also be recorded as an audio file and emailed to you within 24 hours after your reading. Booking Procedure: Please click here to contact us. Please provide your first and last name, phone number and your city/country. This information is important for booking your appointment in the various time zones. We will reply back to you within 48 hours to book your time.